Multicultural, innovative, futuristic — these are just a few words that come to mind when you mention Singapore. One of the Four Asian Tigers, this bustling city-state in Southeast Asia is a fascinating place to visit. On a short trip there, you can explore the gorgeous marina, dive into the city’s ethnic neighborhoods, and even relax on a tropical island. 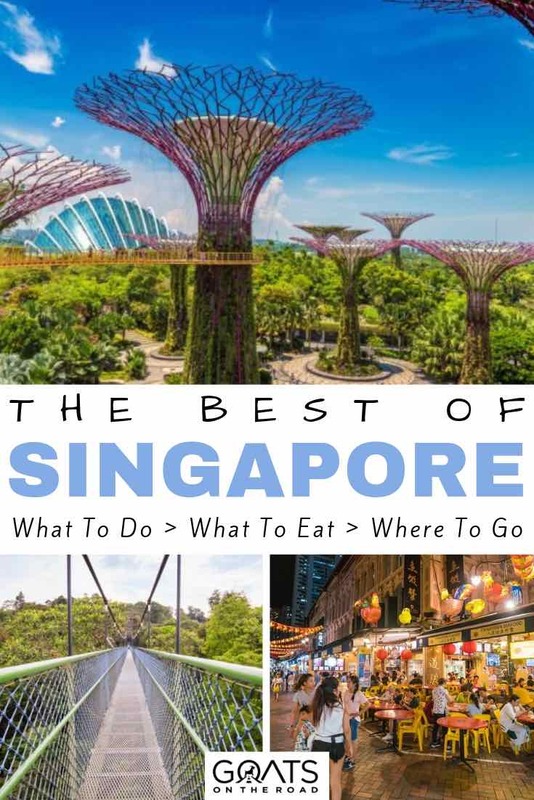 If you’re wondering what to do in Singapore, read on for a detailed guide with some of the best things to do in the Lion City. If you’ve just arrived and aren’t quite sure what to do in Singapore, you can get to know the city by going on a walking tour. Downtown Singapore is quite compact and very walkable, making it the perfect place for a leisurely stroll. A good place to start is by taking the metro to the Esplanade station. From here, you can begin a loop around downtown and check out many of Singapore’s most famous landmarks. 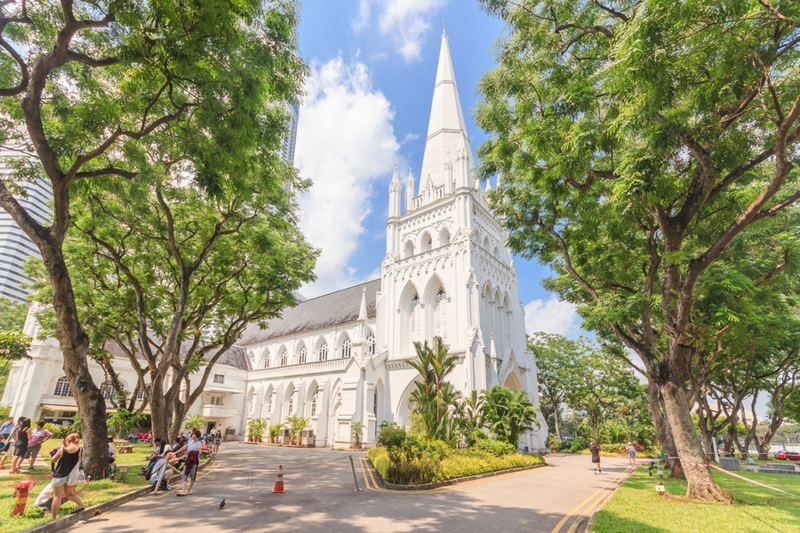 There’s the Raffles Hotel, the War Memorial Park, St. Andrew’s Cathedral, Esplanade Park, and plenty of museums and art galleries within a short walk of the station. When you need a break, there’s no shortages of cafes and restaurants to choose from. You can easily make a whole day of your walking tour and cross off many of the best things to do in Singapore. This is great for those short on time in the city. If you happen to be in Singapore on a Monday, you can join the free walking tour of the Singapore River and Marina Bay with Indie Tours. They go from 9:30AM-12:30PM and are totally tip-based. Every other day of the week, you can still join excellent walking tours of Singapore for a reasonable price. Singapore has to have the most interesting mascot of any nation. The Merlion is a mythical creature that has the head of a lion and the body of a fish. If you’re wondering where this funky combination of animals came from, there’s a good story behind it. Way back in the day before Singapore was a massive cosmopolitan city-state, it was a modest fishing village. Hence the fish body for the statue. 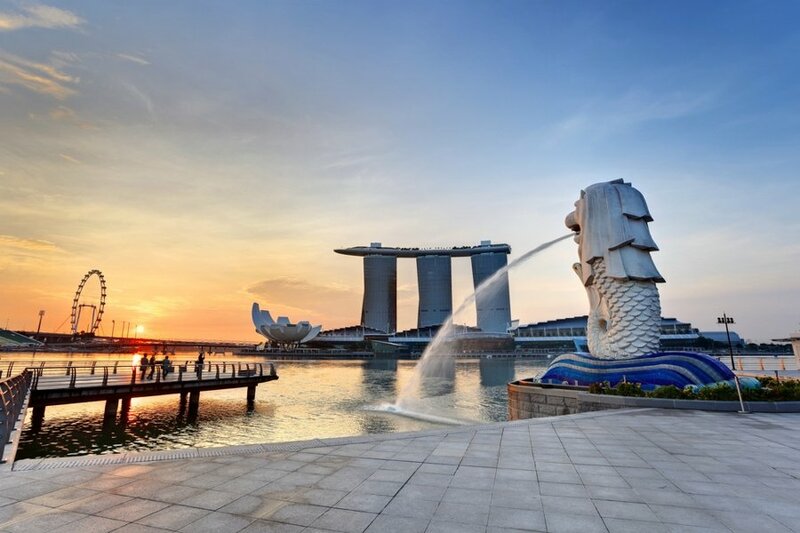 The original name of the city – Singapura – actually means “Lion City,” so that’s where the lion head comes from. The Merlion statue is located just across the Esplanade Bridge facing towards Marina Bay. 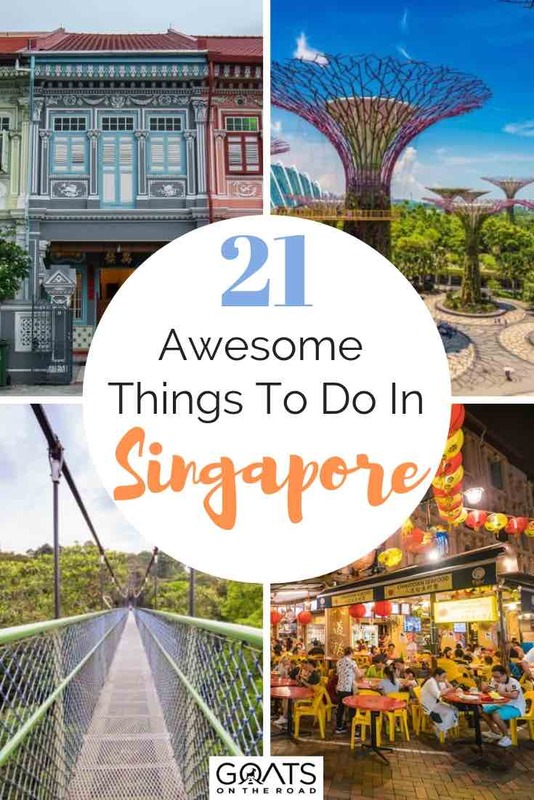 It’s the perfect place to stop for a silly photo op in between the first and third things on this list of what to do in Singapore. A popular choice for a photo seems to be posing so it looks like the statue is spitting water into your mouth. After getting your picture with Merlion, you should definitely spend some time exploring the Marina Bay part of the city. Walking around here, you’ll get some of the best views of Singapore’s modern skyline. Some of the coolest buildings to see are the Float (a floating sporting/concert venue), the Helix Bridge, and the flower-shaped ArtScience Museum. Definitely be sure to bring your camera along to snap some photos of Singapore’s futuristic architecture. On the other side of the bay from Merlion, you’ll find the Marina Bay Sands. This massive complex is a hotel, casino, and shopping mall all rolled into one. 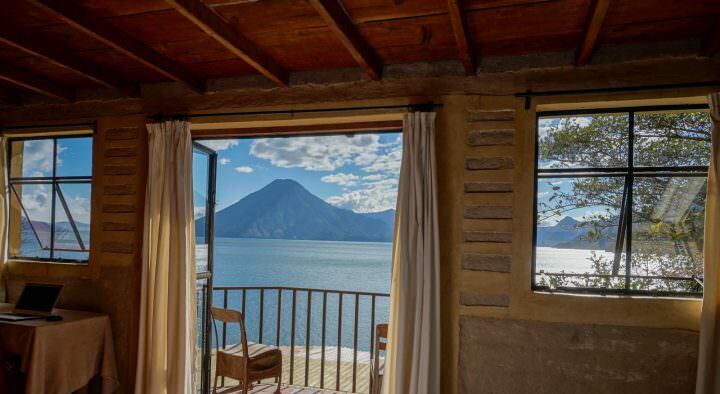 Even if you’re not staying there, it’s worth checking out. For an elevated view of Singapore, you can head to the SkyPark Observation Deck on the 57th floor. It’s open from 9:30AM-10PM Monday-Thursday and until 11:00 on the weekends, with tickets costing $17. One of the quintessential things to do in Singapore is eating in a traditional hawker centre. In fact, if you ask any local what to do in Singapore, this will likely be their first answer. The concept behind a hawker centre is quite simple. Basically, the city wanted to create a more hygienic way for people to enjoy cheap local food than from street-side vendors. Rather than cook out of mobile carts, vendors set up permanent stalls in hawker centres. Be sure you come hungry, as there are countless options available. Some local classics include Hainanese chicken rice and kway teow fried noodles. One of the best hawker centres to visit in Singapore is the Tiong Bahru Market, which is open Tuesday-Sunday from 9AM-8PM. Of all the great activities in Singapore you can do, visiting the Gardens by the Bay is definitely high on the list. This massive nature park is a beautiful place to explore and a major reason why Singapore is known as the Garden City. The Gardens by the Bay are actually split into a few different areas located on either side of Marina Bay. The Bay East Gardens are a great place for a stroll, and they also provide some amazing views of the skyline of downtown Singapore. On the other side of the marina, the South Gardens are home to a few different conservatories. Both the Flower Dome and Cloud Forest are well worth the entrance fee. A combination ticket to visit them both costs about $20. Be sure to carve out at least a couple of hours if you plan to visit both. Even if you don’t end up buying tickets for the conservatories, the gardens are wonderful for just walking around. There are plenty of places to sit and relax, a few restaurants and cafes, and some awesome sculptures to check out. Perhaps the highlight of the Gardens By The Bay are the incredible Supertrees. These tree-like structures look like something out of a science fiction movie, especially at night when they’re illuminated in colourful lights. They’re actually vertical gardens that harness solar energy and collect rainwater. This helps provide energy for the lights as well as water for the fountains. How cool is that?! Hopefully more cities around the world will follow Singapore’s lead when it comes to environmentally conscious development. There’s an elevated walkway high atop the Supertrees, which you can access for $6 to get some fantastic panoramic views of the city. It’s well worth returning to the gardens at night to see the Garden Rhapsody show, when the Supertrees come to life in a mesmerizing light and music display. This goes on every night at 7:45 and again at 8:45. Click here for directions. Another option for getting amazing views of the city is taking a ride on the Singapore Flyer. This 165-meter tall Ferris wheel is located right on the bay and is one of the most popular activities in Singapore for people of all ages. The Singapore Flyer is open from 8:30AM-10:30PM, with the last admission at 10:15. Tickets cost $25 for adults and $15 for children for a standard ride. After your ride, be sure to walk around their scenic rainforest discovery area. For those who want to be a high roller, you can choose to complement your ride with a Singapore Sling ($50), a glass of champagne ($58), or a romantic dinner for two (total cost of $243). Click here for directions. We can’t talk about what to do in Singapore without mentioning the city-state’s many different ethnic neighborhoods. The multi-cultural nature of Singapore is definitely one of its defining characteristics. Singapore has a mix of Chinese, Indian, and Malay cultures. 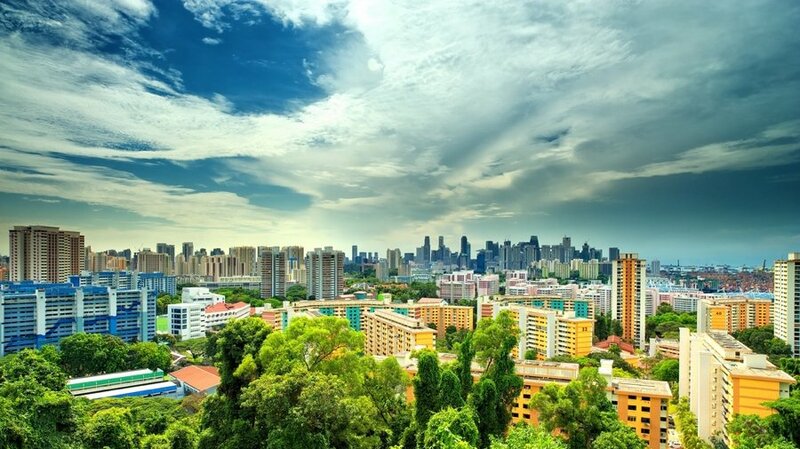 One of the top things to do in Singapore is exploring places like Chinatown, Little India, and Kampong Glam. In all three areas, you can soak up the culture by visiting temples, mosques, and bustling markets. Of course, you can also find some amazing food! 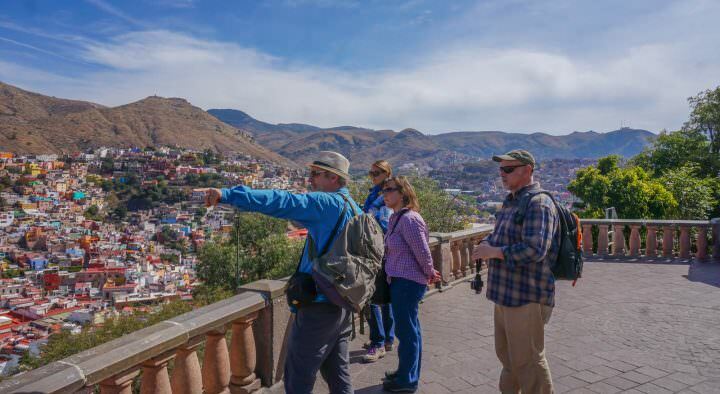 While you can definitely explore all three areas on your own, it’s more fun and informative if you join a tour. Monster Day Tours offers free walking tours of Chinatown on Tuesday, Thursday, and Saturday from 9:30-12:00. They also visit Kampong Glam on Monday and Little India on Wednesday, Friday, and Sunday at the same time. 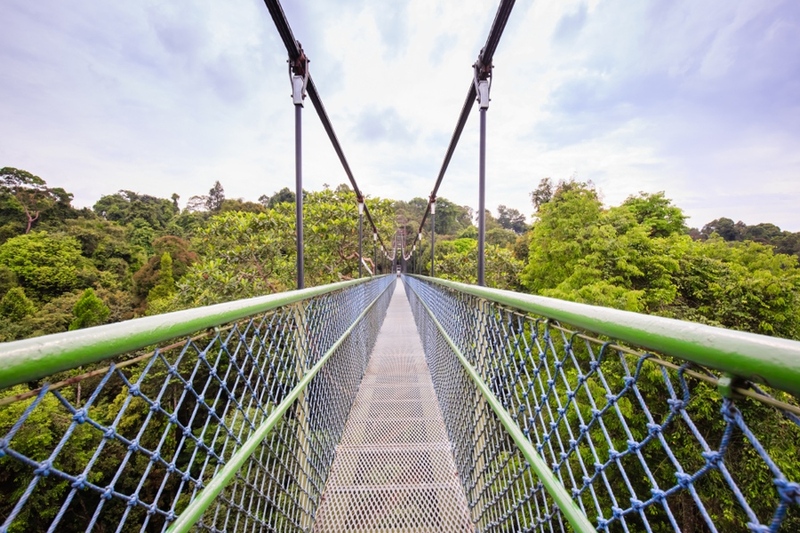 If you’re looking for a bit of nature in Singapore, then you’ll want to check out the MacRitchie Treetop Walk, which is located in the reservoir of the same name. This stunning area features a 250m long tree-top bridge which sits 25m above the jungle. To get to the bridge, you’ll need to hike to the reservoir then head to the Treetop Walk via the MacRitchie Nature Trail or the Venus Drive. Try to time your visit for when the weather is clear, as walking on the bridge can be a bit sketchy when it’s raining. You’ll also want to make sure you wear appropriate clothing, including sturdy shoes, and bring enough water. This bridge above the jungle is one of the best Singapore attractions, don’t miss it! Click here for details to the trailhead. There’s delicious food around every corner in Singapore. You could honestly spend your entire trip just eating your way across Singapore, and it would be a smashing success. 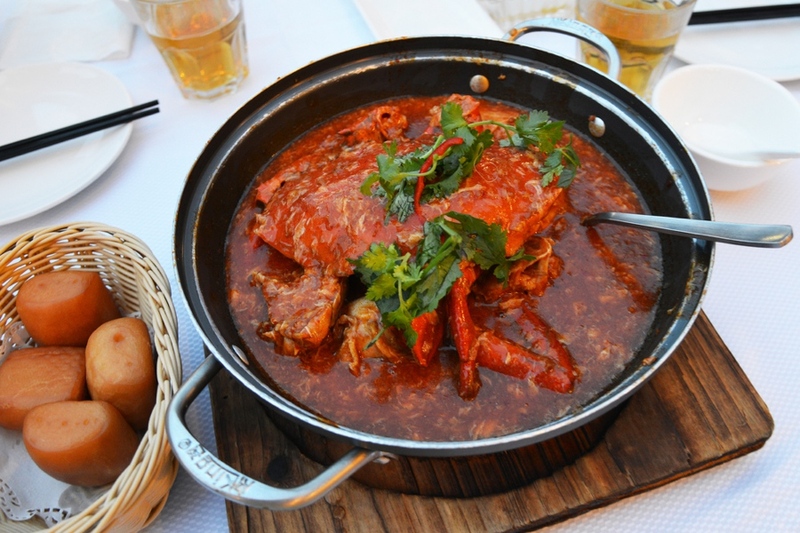 When it comes to local dishes, one that’s definitely a must-try is the famous chilli crab. Despite the name, it’s really not that spicy. Rather, it’s a nice mix of sweet, savoury, and spicy. It’s delicious, and many would call it the national dish of Singapore. There are plenty of places to feast on chilli crab in Singapore. Some restaurants that come highly recommended include Long Beach Seafood, Mellben, and Jumbo Seafood. It’s not a cheap meal, but if you’re going to splurge on a nice dinner this is definitely the one to go for. 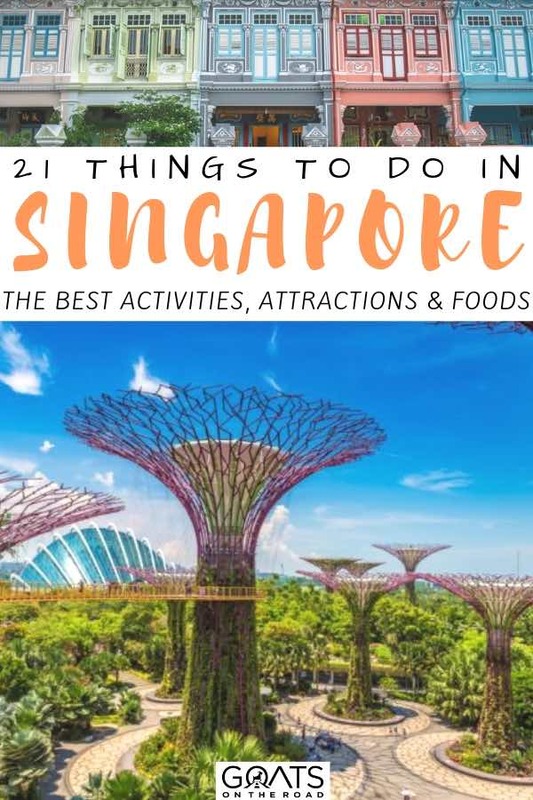 Looking for the perfect itinerary for 3 days in Singapore? We’ve got you covered! One of the best activities in Singapore is taking a day trip over to Sentosa Island. Once a British military base and a Japanese POW camp during World War II, this island was redeveloped into a popular resort area. On Sentosa, you’ll find beaches, golf courses, a casino, a water park, and even a Universal Studios theme park. If you’re travelling with kids, Sentosa is definitely one of the best places to visit in Singapore. They actually call it the “State of Fun,” as there’s so much going on here. You can even try indoor skydiving! You have a few options for getting over to Sentosa Island. You can take the metro to the Harbourfront Station and then walk into the VivoCity Mall to catch the monorail over to the island. For a more scenic trip, head instead to the Harbourfront Tower II to hop on the cable car. It’s also more expensive – the monorail only costs $3 round-trip, while the cable car goes for about $21. If you’d rather get some exercise and save money, you can actually walk across the garden-themed Sentosa Boardwalk. Don’t miss a trip to Sentosa Island, it’s definitely one of the best Singapore attractions. If you’re going to visit Sentosa, you might as well check out Mt. Faber as well. The same cable car that takes you over to the island also climbs to the top of one of Singapore’s tallest hills. Once you get to the peak, you can enjoy some incredible panoramic views. On a clear day, you can even see parts of Indonesia and Malaysia from here! Looking the other way, you can get some awesome photos of Singapore’s modern skyline. Other things to do up at Mt. Faber Point include ringing a bell of happiness, checking out a mural that depicts the history of Singapore, and walking along the many scenic trails. There are also a few restaurants here, where you can enjoy a drink and a bite to eat as you watch the sunset. This may seem like an odd choice for an article about what to do in Singapore, but honestly the city-state has one of the coolest airports in the world. It’s actually been voted the World’s Best Airport for six years running by Skytrax! I seriously hate going to airports, but I look forward to arriving at Changi in Singapore every time. This place has a butterfly garden, a rooftop pool and jacuzzi, movie theatres, art installations, and so much more. The Singapore airport is even home to the world’s tallest indoor waterfall. It’s called the Rain Vortex, and it turns into a light and sound show at night. Other attractions coming soon include a canopy park, a suspended trampoline park, and a hedge maze. See – I told you the Singapore airport was cool! Whenever you’re walking around downtown and aren’t quite sure what to do in Singapore, a great place to go hang out for a bit is Fort Canning Park. Although it’s a relatively small park in size, Fort Canning is a very important piece of Singapore’s history. Many centuries ago, this was known as the Forbidden Hill. It was the site of royal palaces from the old kingdom of Singapura. In more recent times, it was where the British surrendered to the invading Japanese during WWII. Taking a walk through this park is like taking a walk through the history of Singapore. There are many historical landmarks around the park, such as the Battle Box (a war bunker), the Maritime Corner, and the ruins of the original Ft. Canning. These days, the park is a popular place to hold events and concerts. Definitely make sure to check the calendar to see if anything is going on here during your visit. You can find the park on the map here. A great way to spend a day in Singapore is by combining a visit to the park with a bit of museum hopping. Within a short walk of Fort Canning, you can find several of Singapore’s best museums. The best place to start is the National Museum of Singapore. Here you’ll learn about the history of the city-state through a variety of exhibitions, some permanent and others temporary. It’s open every day from 10AM-7PM and tickets cost $20 for access to all exhibits and galleries. Just a block away, you’ll find the Singapore Art Museum. This excellent contemporary art museum focuses primarily on local and Southeast Asian art. Their main building is unfortunately closed for renovations, but they are still organizing events and galleries all over the city in the meantime. While it’s very much a bustling city that’s always on the move, there are plenty of activities in Singapore where you can escape for a bit of peace and quiet in nature. 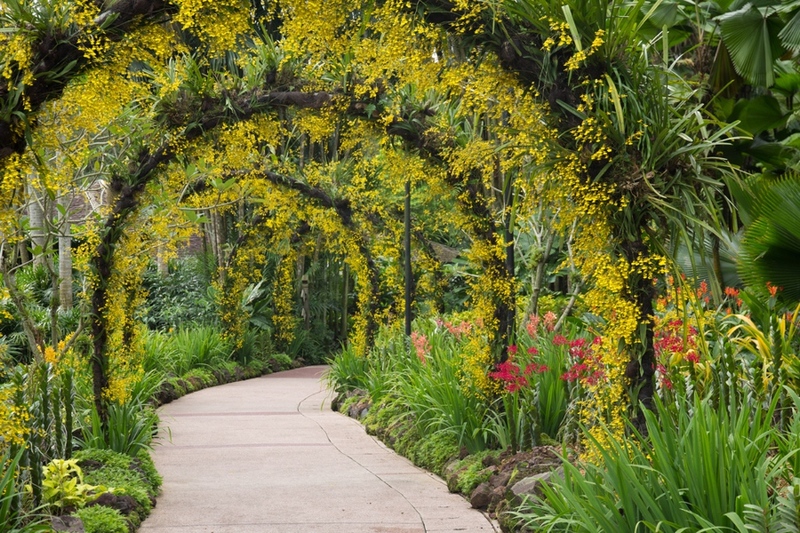 One of the best options is a trip out to the Singapore Botanic Gardens. 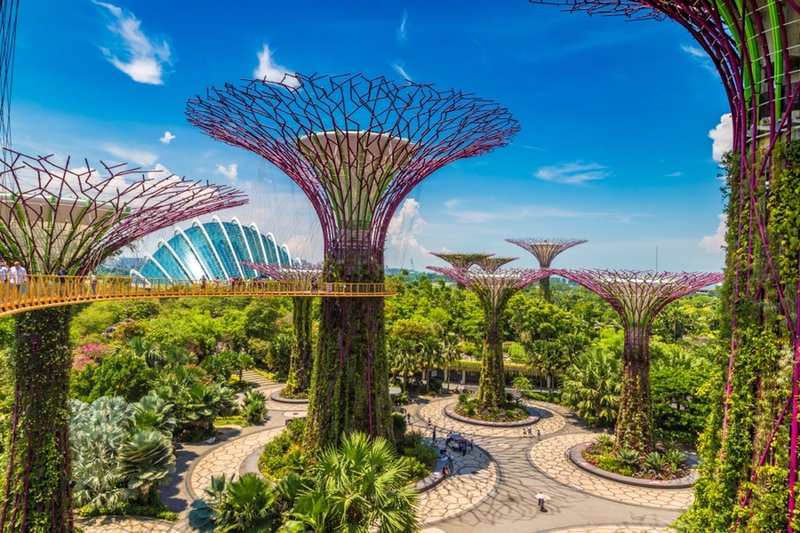 The gardens were actually the first UNESCO World Heritage Site in Singapore, and they’re the only tropical botanical gardens on the list worldwide. They’re absolutely massive (183 acres), with a wide variety of gardens, lakes, and nature trails to enjoy. The Botanic Gardens are open from 5AM-midnight every day and are totally free to visit. They also offer free guided tours every weekend, so be sure to check their schedule to see what’s going on. One thing you’ve just got to do when travelling here is sip on the city-state’s most famous cocktail. The Singapore Sling is a gin-based cocktail with two parts gin and one part cherry brandy. Other ingredients typically include Cointreau, an herbal liqueur called Bénédictine, Grenadine, pineapple juice, lime juice, and bitters. It’s usually garnished with a pineapple slice and a Maraschino cherry, making for a refreshing and delicious cocktail. This classic cocktail was invented here back in 1915 at the Long Bar in the famous Raffles Hotel, and that remains one of the best places to have one. It’s not a cheap drink (about $26), but when in Rome, right? You also get all the peanuts you want, and you’re even free to toss the shells on the floor. If you’re the type who enjoys skinny jeans, ironic facial hair, and indie bands that no one has ever heard of, you might want to check out Haji Lane. Singapore’s hipster-hangout is the perfect place for a stroll, with plenty to see and do to keep you entertained for a while. Haji Lane is famous for its street art, and there are several colourful murals that adorn the walls here. There are also plenty of quirky shops here, so it’s a great spot for a bit of window shopping. On the weekends, the lane is car-free and is bustling with activity. In addition to checking out the art and perusing the shops, Haji Lane is a popular place to go out for a coffee or a drink. The best way to get here is by riding the metro to the Bugis station. You can find Haji Lane on the map and get directions here. Thanks to its multi-cultural identity, Singapore has festivals going on all throughout the year. No matter what month you visit Singapore, there’s sure to be a festival or two going on. Whether you’re into food, art, culture, or sports, there’s a festival for you in Singapore. Some of the many events going on in Singapore include an international arts festival, traditional Chinese celebrations, modern music festivals, and even a Grand Prix race. For a closer look at the best festivals in Singapore, check out this article from Time Out. If you happen to be in town at the right time, experiencing a local festival is definitely one of the top activities in Singapore. 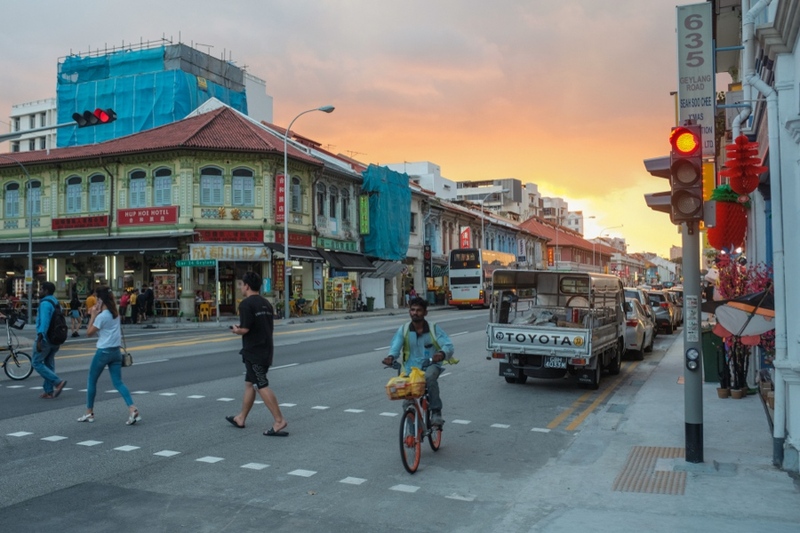 If you do a search for Geylang, you’ll find that it’s known as Singapore’s Red Light District. Don’t let that deter you from visiting, though, as it’s a beautiful part of the city that’s well worth exploring. A major highlight of visiting Geylang is seeing the incredibly colourful two-story shophouses. Incorporating a variety of styles from all over the world, these storefronts are very emblematic of Singapore as a whole. If you come here a bit later in the afternoon, you can wander around snapping photos in the daylight and then stick around for some street food and live music. Click here for directions. 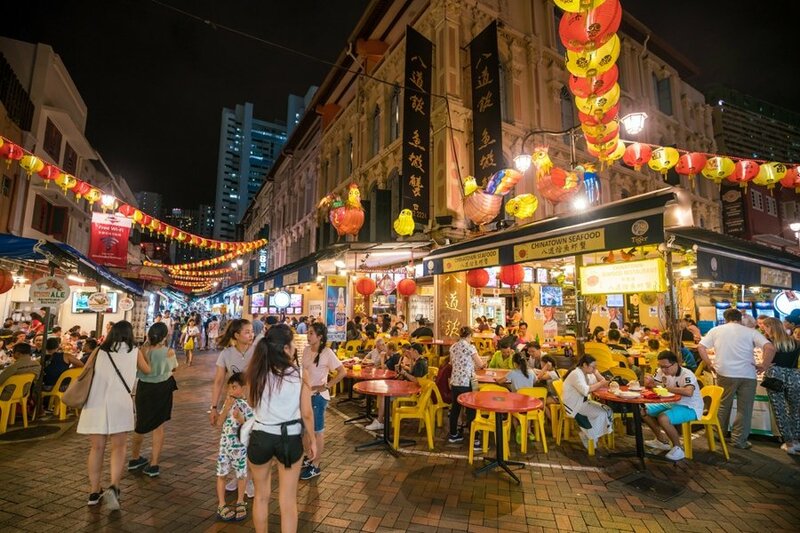 Singapore may not be as famous for its nightlife as some of its neighbors in Southeast Asia like Bali or Bangkok, but that doesn’t mean the party isn’t raging in the Lion City! As a matter of fact, there are plenty of places to let loose for a fun night out in Singapore. One of the most popular nightlife areas here is Clarke Quay. There are tons of bars, restaurants, and clubs that line both sides of the Singapore River here, so you’ve got plenty of choices! Thanks to its proximity to downtown and the CBD, Clarke Quay attracts a mix of locals, expats, and tourists. It’s a great place to go out and meet people, and it just might be one of the most scenic places to party in Southeast Asia. 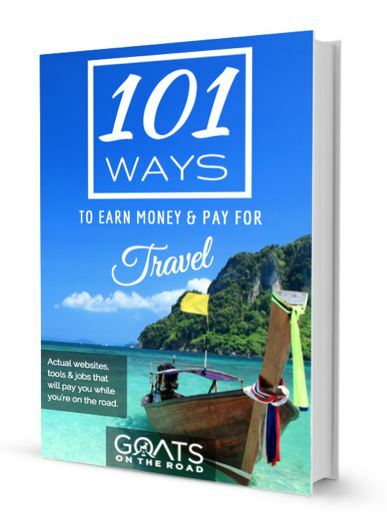 Now You Know What To Do in Singapore! I’ll be honest with you — Singapore was never high on my list of places to visit. “It’s too expensive… it’s too strict… it’s too conservative.” These are all arguments I made with myself against going to the Lion City. However, after travelling there on a few occasions now, I’ll admit that Singapore has grown on me. It really is amazing to see the mix of cultures in Singapore and how well it works. Plus, you get to eat amazing Chinese, Indian, and Malay food here! I don’t know about you, but my culinary heaven looks a lot like a hawker centre in Singapore. 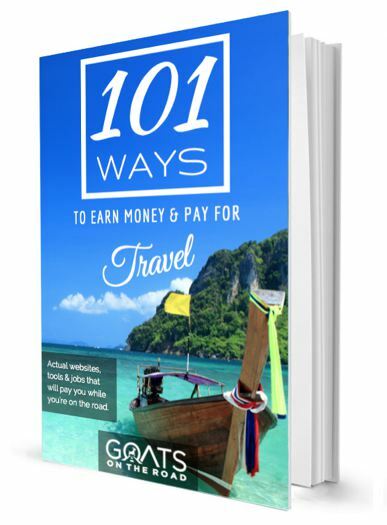 I hope this guide has helped you figure out what to do in Singapore when you visit. The city-state has a lot to offer, and I for one can’t wait until I can get back there and dive a bit deeper into all the amazing things to do there. Images in this article courtesy of Shutterstock.com. Singapore is one of my most favourite places in Southeast Asia. It’s not the cheapest place to visit, but it does have a lot to offer and a sweet atmosphere. This is great! I love the mix of local and touristy suggestions. I love Singapore, although the humidity sometimes gets me.